The display of mail art from the Mail Art Call, Celebrate IUOMA 25, was a wonderful success. My thanks to all who sent entries! The event was held at the Lucie Stern Community Center in Palo Alto, California. About 300+ visitors viewed the display. At least 160 took the informational handout and stopped to ask questions about mail art and how to become involved in the IUOMA network. Mail artists stopped to chat about their own experiences. It was a pleasure to meet Raphael'L, an IUOMA member from San Jose. 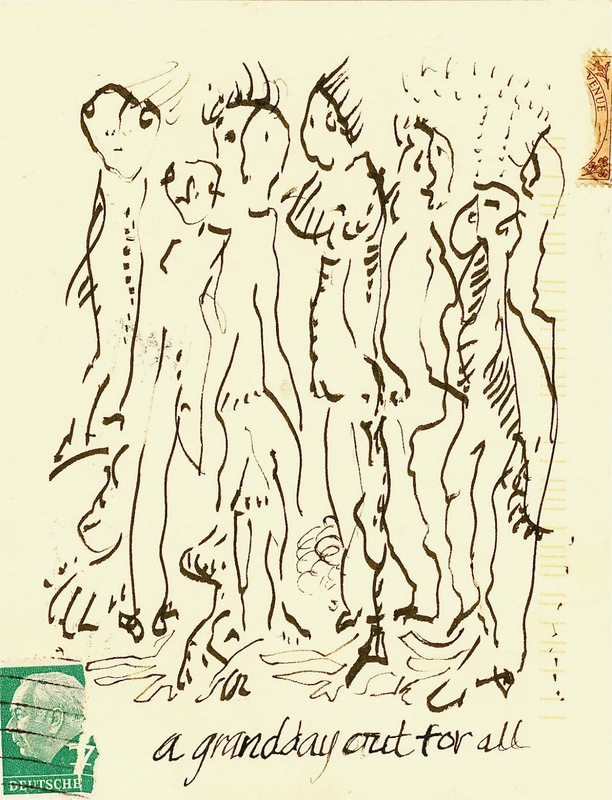 Visitors spent time examining the postcards, the decorated envelopes (Guido Vermeulen's and Celestial Scribe's were a popular), and reading the 'zines from Jon Foster and Russell Manning. The collaborative book by Jon Foster and myself was a favorite, too. The book takes off tomorrow for the exhibition, 'mail/art/books' at the San Francisco Center for the Book. The exhibition is scheduled for February 14 - April 30, 2014 in San Francisco, California. View photos of the Book Arts Jam event below. The list can be found at blog entry #38 below. 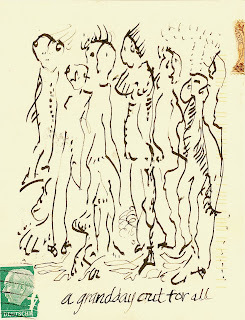 The free artists stamps that I prepared were successful in drawing visitors to the display. For anyone who wanted information about perforated paper for artists' stamps/artiststamps: I purchased perforated, non-gummed paper from www.100proofpress.com. Gummed, perforated paper is available, but expensive, search online. Check out http://www.zazzle.com/create for making stamps to use on USA mail. Part of the display was set aside for visitors to make their own mail art. It was popular with children and adults. Art materials were available: blank postcard-sized paper, colored pens, pencils, markers, collage papers & pictures, rubber stamps, vintage cancelled postage stamps, scissors and glue sticks. Two of the postcards made are seen below. Mail Art Mania: Visitor looking at envelope by Patricio/Celestial Scribe. 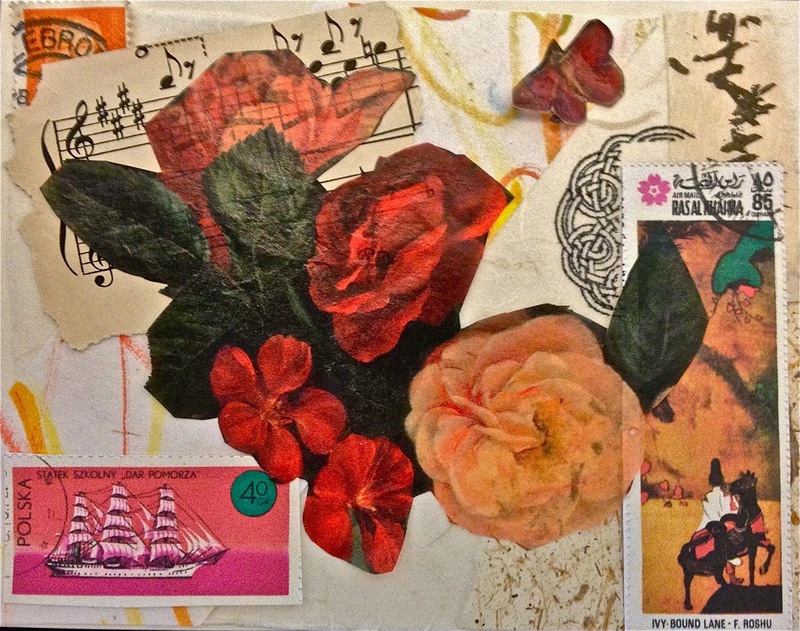 Mail Art Mania: Friend and founder of BABA, Jone Manoogian, greets visitors. Good to see an exhibition of mail art, here at Brazil is very complicated to happen! Thanks for your comment--it was a lot of work to organize this, but worthwhile because visitors really enjoyed the mail art.